This post was sponsored by OXO. Thanksgiving is just around the corner. 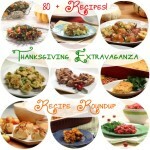 Last year I did a whole month of Thanksgiving recipes. This year, I’m covering the center of the feast – the TURKEY! 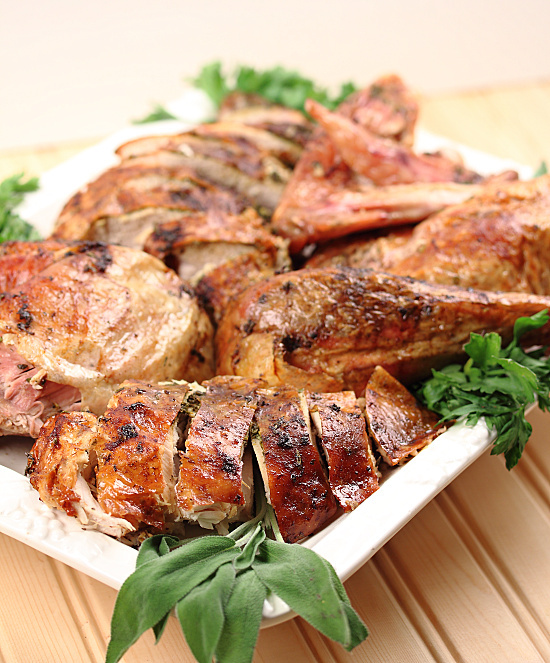 There is a lot of controversy that surrounds this famed American tradition of turkey roasting. Stuff it? Baste it? Cook on a rack? In a bag? Roast all day at a low temperature or in high heat to sear in the juices? Then there’s wet brining, dry brining, oil or butter, the list goes on. I’m not going to tell you any one method is better than another. If you have a tried and true method of cooking your turkey, I am certainly not going to try to make you change it. What I will do is offer a few tips and tricks of my own that have worked for me. And if you want to share some of yours, please do so by commenting below! Now, back to that bird. 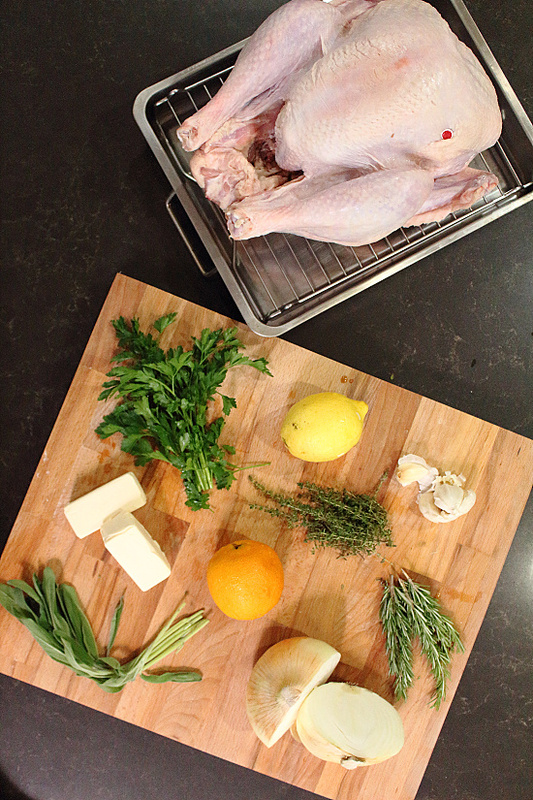 For my turkey, I use a good dose of Simon and Garfunkel… Parsley, sage, rosemary and thyme. Anyone? Bueller? 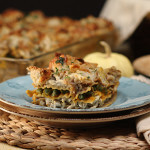 Ahem, for reals now, this is the perfect combo of herbs for Thanksgiving. Add in some butter and wine and it’s perfection. Brining: I don’t bother. It takes too much time and effort (and space in my fridge). That said, if I find a turkey that has already been brined, why not? Fresh or Frozen: I like to buy fresh birds because, well again, time. I don’t want to defrost a frozen bird in my fridge for 4-5 days. I preorder my fresh turkey and pick it up the day before. I let it sit uncovered in the fridge overnight to let the skin dry out and take it out of the fridge 1 hour before cooking. Stuffing: NO. Just no. I’ll take my dressing on the side, thank you. 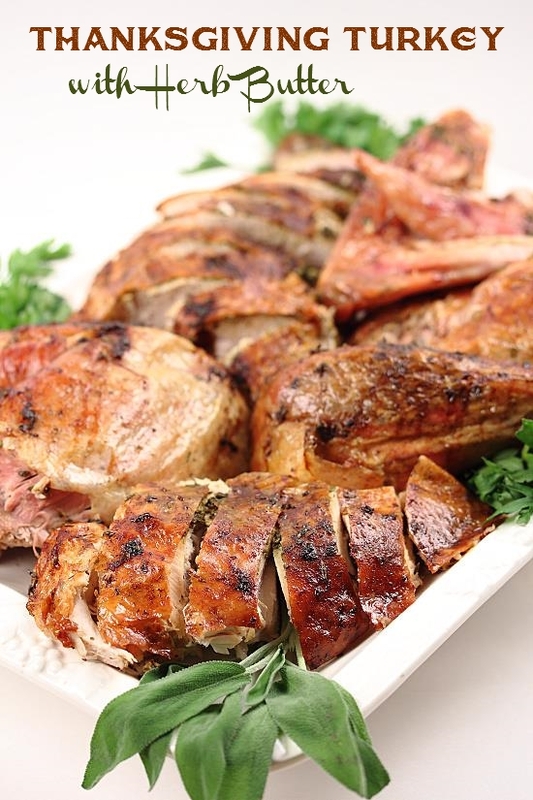 Not only do you need to overcook the turkey to get the stuffing up to a safe temperature, the thought of eating softened sausage and bread out of the cavity of a turkey? – eww. Twine: I tie my turkey legs together with twine. It keeps all the goodies inside the bird and it looks pretty. 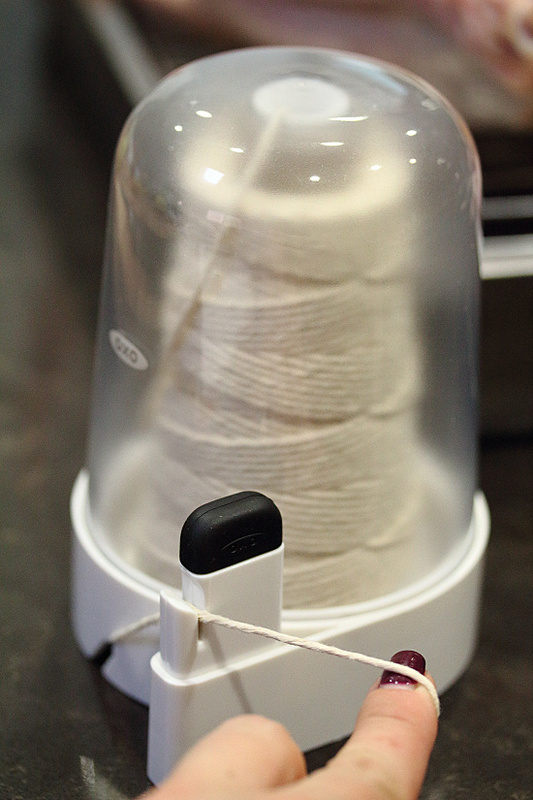 OXO makes it easy with simple pull & cut twine system. Turkey Timers: I never rely on the turkey timer. They are not reliable. I always have a real thermometer and test the temperature of the turkey in 3 places: the breast, the thigh crease and the thigh. Once the turkey registers 165 degrees, I remove it from the oven. This time when I took my turkey out of the oven, the turkey timer popped out 10 minutes later. No good. Rack or Bag: I have cooked turkeys in both a cooking bag and on a rack. The bag has produced some juicy meat but the skin doesn’t crisp. And who can resist a good piece of crispy skin? C’mon, it’s Turkey day. You’re allowed to indulge a little. Temperature: I like to start out at 450 for 30 minutes and then reduce the heat to 350. This allows the fat to melt quickly and help keep the turkey moist. 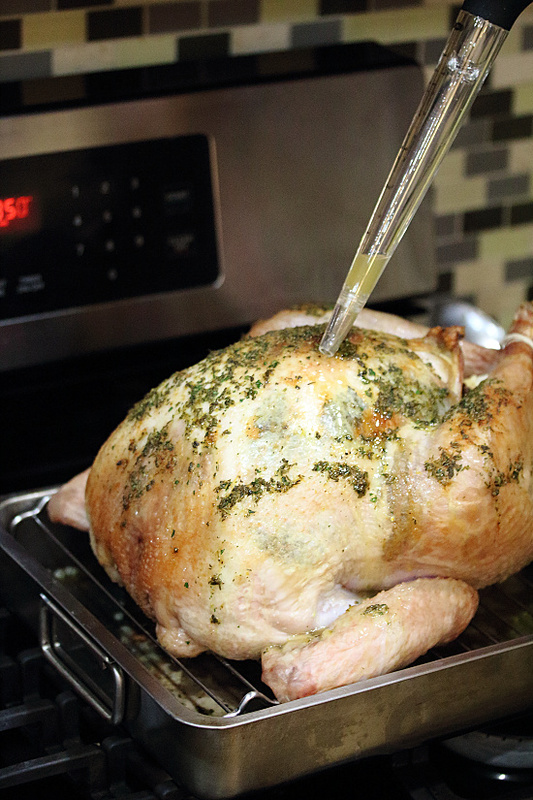 Basting: Many will tell you not to baste because it reduces the temperature of the oven, blah blah blah. I like to baste. It cools the temperature of the skin down which helps to keep it from burning. This a hotly debated topic and I say to each his own. I love OXO’s angled baster. 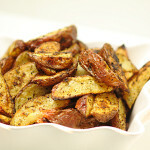 It makes it easy to get into the crevices of the roasting pan and pull up those juices. 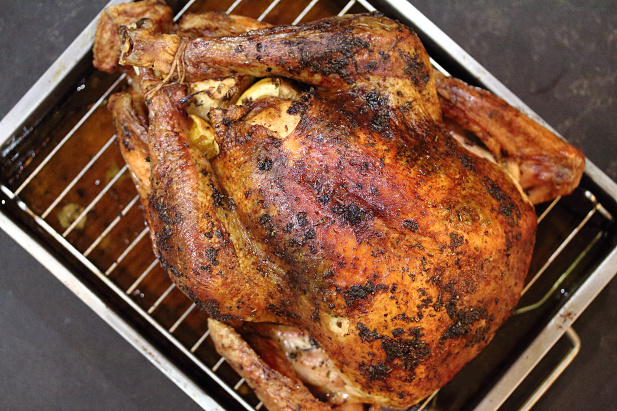 What are your turkey dos and don’ts? Successes and failures? Weigh in. And don’t forget to enter to win! 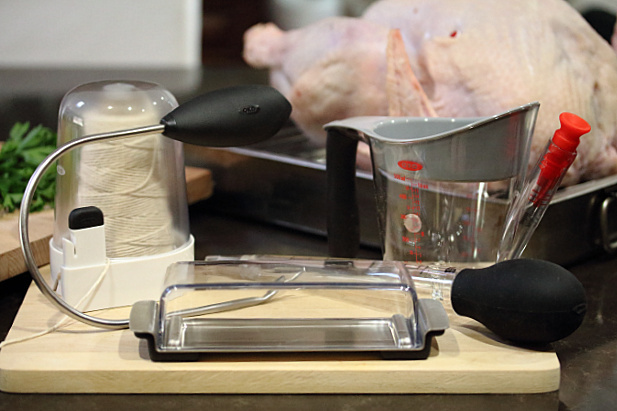 I received the above-mentioned set of OXO tools to assist in creating a turkey recipe for #OXOTurkeyDay. I received no other compensation and all opinions are my own. 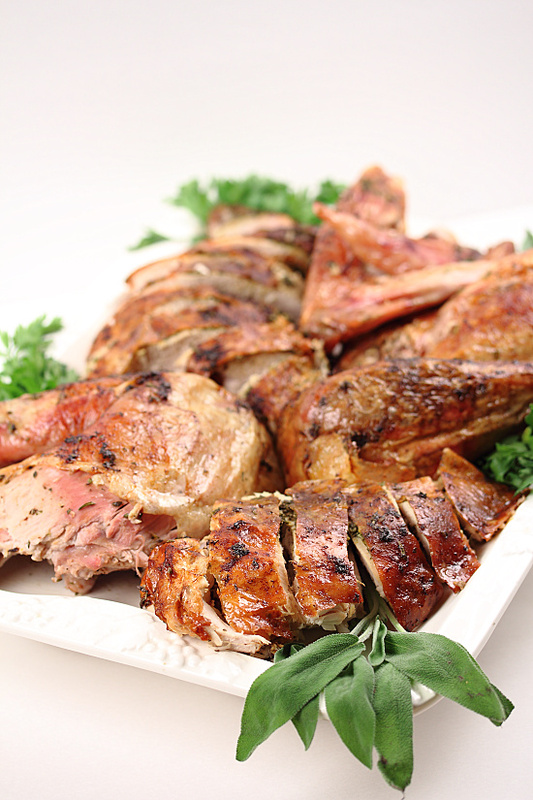 Rest fresh or defrosted turkey uncovered overnight in the refrigerator. 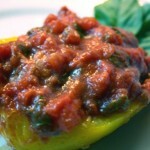 Remove from refrigerator 1 hour before cooking. Zest the lemon and orange. (Set aside fruit.) Mix zest into the butter together with the parsley, sage, rosemary & thyme. Set aside. Run your hand between the breasts and the skin, being careful not to tear the skin. Stuff it with half the herb butter mixture. Rub the rest of the herb butter on the outside of the breast. Tuck the wings under the bird. Place the turkey on a rack in a roasting pan and into the oven. Bake 30 minutes. Meanwhile, combine the wine and turkey stock in a large measuring cup. Juice the remaining halves of the orange and lemon into the liquid. After the 30 minutes has passed, reduce the oven temperature to 350 and baste the turkey with the wine/stock mixture. Baste every 30 minutes until the turkey is done – 2 ½ to 3 hours or until temperature measured at the thigh reaches 165 degrees*. Remove turkey from the oven and let it rest for 20 minutes before carving. *Generally, the cooking time is 13 minutes per pound of turkey. Adjust your cooking time as necessary for the size turkey you have. 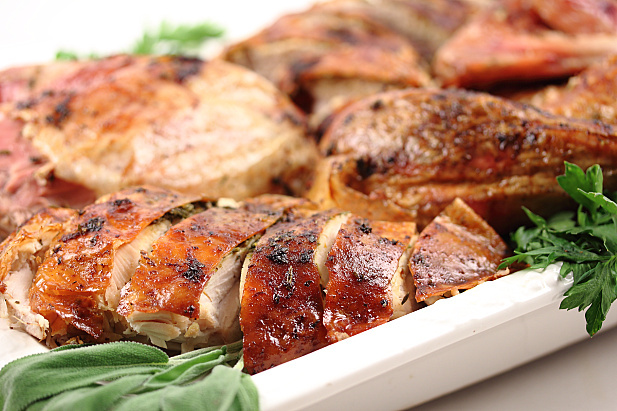 Love your use of citrus with the turkey. I always brine it for my family, and it does take a while, but the flavor is awesome (according to them, I don’t eat meat). 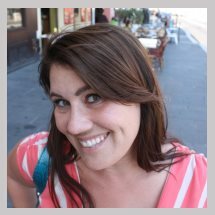 It is always nice to see different tips and what works for others pop up. Christina, you go through all that effort for your family and don’t even eat it yourself – how kind you are!